Minimalism needn't be stark; here, a limited three-color palette combines florals, polka dots, stripes, and curves to keep the look light-hearted and pretty. Placing items on kitchen shelves — as opposed to behind cabinet doors — opens up the space and gives it a modern feel, but it offers a special challenge. How do you organize the shelves to look neat, organized, and coherent so that the room where everyone invariably gathers doesn't look like a cluttered mess? Likewise, steer clear of a rainbow of colors. While sticking to a tight palette of two or three colors max, you can keep things visually interesting by making sure the objects have different textures, shapes, and finishes. Incorporate a variety of unfinished and uncolored natural materials (wood, metal, glass), which read as neutral but add texture, too. Framed art and an infrequently used tagine stored on the top shelf tie the composition with the mustard-colored wall. Shelves not only serve as storage—they can show off beautiful objects. Intersperse a few focal pieces such as a candelabra, cake stands, or large, eye-catching bowls with groups of the objects that you use frequently, like plates, bowls, cups, and glasses. Place patterned plates upright, to show off their designs. Stick with only things you find beautiful. Food packaging can be unattractive, so avoid it unless there's a compelling reason to include it on the shelf—maybe it's a quirky tin with colors that incorporate your color scheme, for example. If you wish to store food items on the shelves, place them in canisters that match the aesthetic tone of the other things on display. Also, keep in mind that bigger is better. Many small, individual items look chaotic, while large ones don't. A grouping of two or three stacks of identical small drink glasses reads as a large thing, rather than many small ones. Grouping similar things together creates focus—and also makes for efficient use of items. Place all your cups together, for example. Or arrange by color. If you have many uncoordinated items, try assigning shelves by purpose. For example, keep all your cookbooks in one spot, and all your tea-time accoutrements in another. You can also store a hodgepodge of similar items—say, baking tools—in a basket on the shelf. The basket keeps the visual clutter out of sight, while keeping things you're likely to need at the same time together. Long shelves look better than short ones. Note the clusters of plates and bowls, arranged in stacks of varying heights. 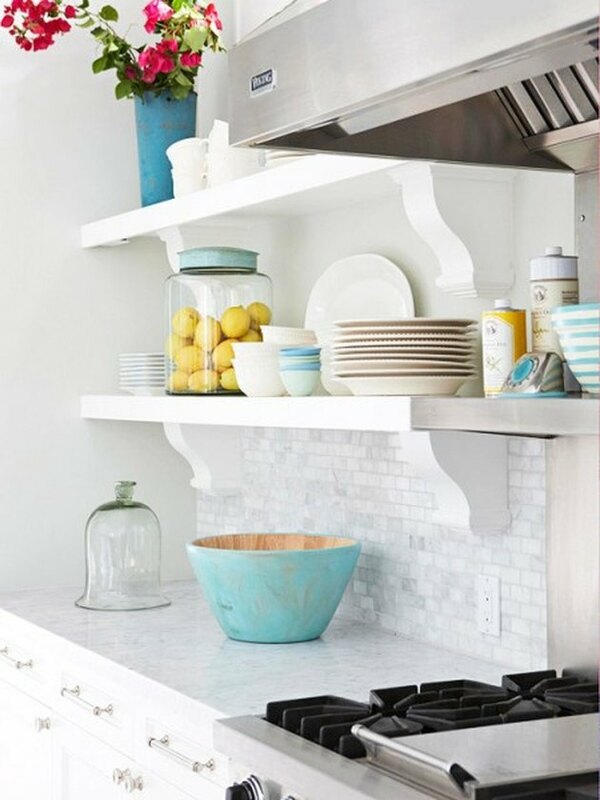 Use open shelves for things you actually use, so the shelves don't look like grandma's china cabinet. 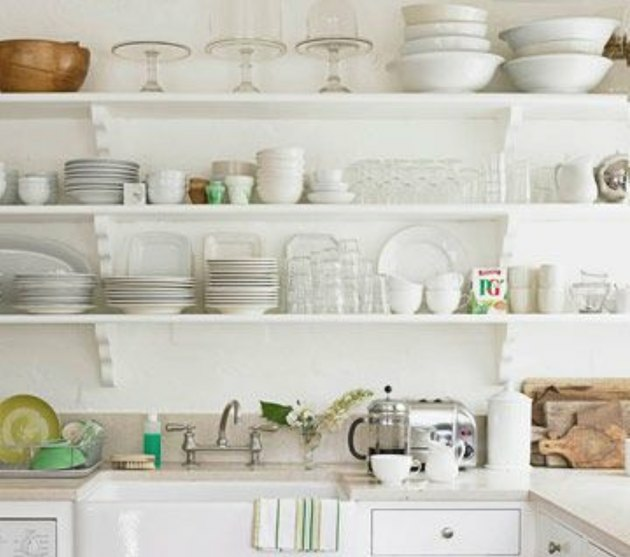 Store the pieces you serve with most frequently—such cups, plates, or a vase filled with wooden utensils—on the bottom shelves, where they're easier to reach. This also keeps grime and dust from accumulating, since you'll be using using and therefore washing items regularly. Display items that you employ less frequently or not at all on the higher shelves. Placing things behind one another can look messy—the one exception being that it's okay to place short items in front of flat objects like upright plates or cutting boards. 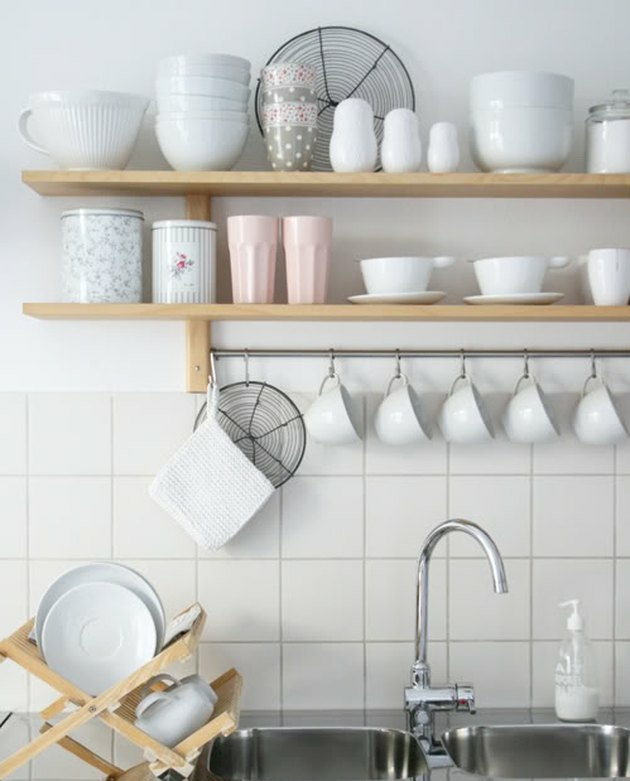 On the other hand, stacking items like cups and saucers, bowls, or drinking glasses will make them look orderly, even if they're slightly off-kilter or even mismatched, and the different heights keep the eye interested in the composition. 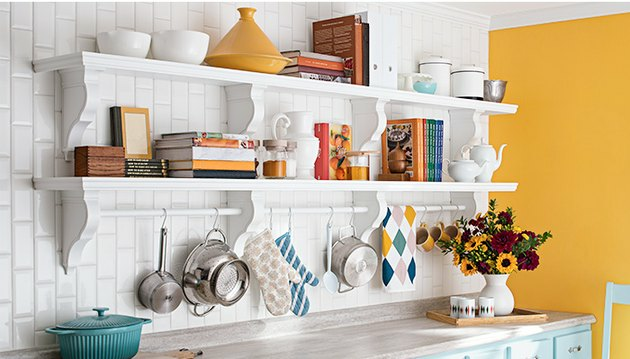 Remember, you can cluster flat things such as books, cutting boards, or plates either horizontally or vertically. If you've got the space, tuck a few pieces of artwork among the more utilitarian objects. This is a way to inject some of your own personality into the visual collage. Adding a small vase of greenery or flowers introduces some vitality and prettiness into the still-life on the shelf. A jar of lemons and a vase of flowers inject life and beauty into shelves of otherwise utilitarian objects.